Designed with fast mountain walking and backpacking in mind, the Montane Men's Alpine Trek Pants use Granite Stretch Lite throughout; a lightweight nylon-face fabric with stretch which offers excellent dual abrasion and wind resistance. 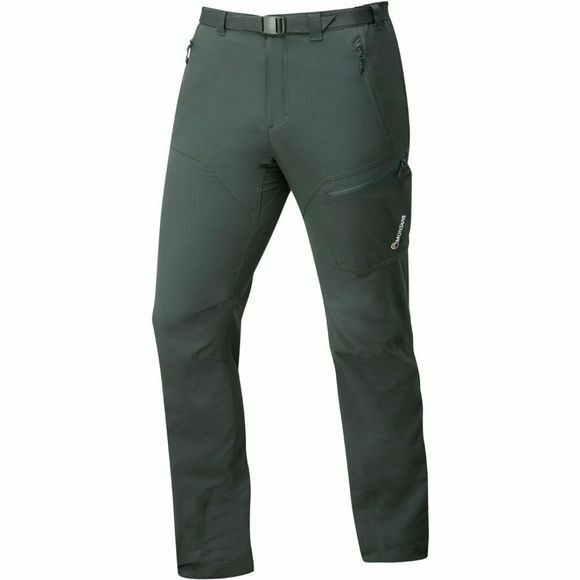 Technical features such as a variety of pocket options and tough Cordura instep reinforcements make these pants perfect for use year round in all but the worst conditions. Granite Stretch Lite is a lightweight nylon stretch fabric with a denier gradient structure, which combines wind and abrasion resistance on the outer face with a structured wicking inner face. It also has a durable water repellency which will shed light rain. Lightweight, hard-wearing Cordura Rip-stop instep provides enhanced abrasion resistance. Articulated knees and an active cut for high step movement, perfect for mountain use. Gusseted lower legs make the pants versatile enough to accommodate both mountaineering boots and lighter weight footwear.